Titan is one of the largest contract manufacturers of welded components in the Midwest. Our extensive welding department is supplemented by several robotic welding cells. 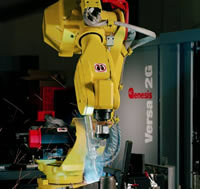 Careful thought has been placed in the type of robots purchased to maximize our welding flexibility. For smaller higher volume part applications we have rotary tables that allow the operator to unload and load on one side while the part is being welded on the other side. For larger lower volume weldments Titan has “head stock tail stock” welding systems that allow parts to be flipped so the robot has access to the top and bottom of the part. Our automation in the welding area along with implementing lean manufacturing principals on selected welding lines has enabled us to improve welding consistency and quality for our customers while reducing labor costs.